For people with the name, see Anslow (surname). 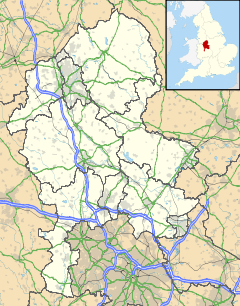 Anslow is a village and civil parish in the East Staffordshire district of Staffordshire, England, about three miles north-west of Burton upon Trent. According to the 2001 census, the parish, which includes Anslow Gate had a population of 669, increasing to 805 at the 2011 census. John Lanham is currently Chairman of the Parish. The village has a pub, The Bell Inn, which serves food daily. However, it's often thought to have two, but the popular Burnt Gate (now closed) was at 'Rough Hay' about a mile south of the settlement. Colin Owen - Anslow. The History of a Staffordshire Village. 1995. ^ "Civil Parish population 2011". Retrieved 2 December 2015.